NC84E / NC84 :: JNC84E / JNC84 :: AMD 785G + SB750 Chipset :: AMD AM3 / AM2+ / AM2 :: JETWAY COMPUTER CORP. 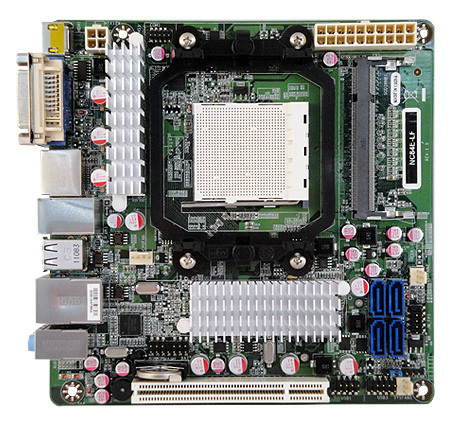 The NC84E supports the above AMD AM3 processors up to 95W. Jetway recommends only up to 65W processors when installing the NC84E into a small compact mini-ITX chassis and using a low-profile heatsink/fan may be required. When using above 65W processors please use a larger chassis with adequate airflow. Some stores may include a low-profile CPU heatsink/fan for <45W processors, not included in standard packaging. 125W and 140W AMD processors not supported. BIOS update may required to support new coming AMD CPU. Revised History [A02]. Fixed SYSFAN2 speed not shown.